Our Gorillas are no strangers to the township of Langley – in fact, this is where many of our maintenance experts call home. Every day, friends and neighbours are calling in Gorilla Property Services to care for their commercial, multi-unit and residential properties. No matter the size of space, gutters are a tough spot to reach. 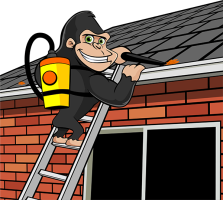 For any chore that takes your feet off of the ground, like proper eco friendly Langley gutter cleaning services, contact us today, and have our Gorillas do it for you! Organic debris is a common problem throughout Langley but it is most obvious in spring and fall months. As temperatures change, local plant life begins to bloom or cast off, making way for a new season. These changes might be nice to look at, but they are not doing your property any favours. It is easy to see when lawns need raking, but in the same way leaves hit the street, they are hitting your gutters. Organic material is constantly dropping into gutters of both homes and businesses. Without proper maintenance, gutters can take on a life of their own. You might have caught glimpses of unwanted plant growth on top of roofs or spilling out of drainage pipes, but that is only the beginning! Invasive plant growth is never good, but it is only one aspect of clutter consequences. Leaves and sticks are not exactly intimidating on their own. These small materials, however, can cause major problems. More solid materials like seed pods, needles, or twigs cling to the bottom of pipes and collect new, lighter items. Pulling out top layers might improve the condition of your perimeter drains but it won’t last long. There isn’t much use in putting time and effort into these temporary measures. Instead of settling on sub-par results, our Gorillas create a plan that caters to your property. 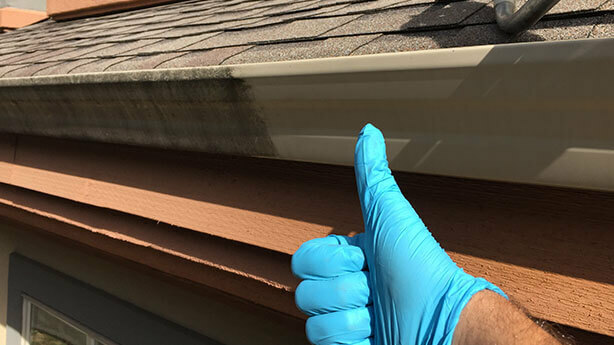 Our particular brand of Langley gutter cleaning might be geared primarily toward commercial and multi-unit or strata properties – but we handle homes as well! Simple tools like gloves and ladders might be the standard in amateur cleaning, but an in-depth clean requires a more, well thought out, plan. Any Gorilla maintenance service uses a simple, 6 step process. Safety is paramount for our Gorillas. Ladder installation is double and triple checked before starting any service. No matter how much forethought is put into a service, accidents happen. Instead of leaving things to chance, our Gorillas are fully insured to protect themselves and your property. Once access to the roof is safe and secure, we take some before photos. This way you can see just how much debris has built-up since your last service. Next, we get down to the nitty gritty. We clean the roof and vacuum the gutters using the most efficient methods and up-to-date tools. Next up is water testing the downspouts. This ensures the entire gutter system is free of blockages, allowing rain water to flow freely off the roof to the drainage system below. Following these essential steps, our Gorillas snap some after shots. We want our customers to see the first rate service we offer without having to risk their neck climbing a ladder.